There are various languages spoken in the Western Himalayas that are loosely put together called “Pahari” which itself is a wide term which seems to include n number of different dialect unintelligible to the speaker of one language to the other. Here we try and understand the inter-relationship between these Pahari dialects as well as the relationships that they hold with major languages which are spoken in and around them chiefly being Punjabi as the areas we are considering here were a part of Greater Punjab at one point of time. Also we try and see the relationship of these wrt to Dogri, which is a close relative of Punjabi as well as with Kashmiri. These dialects mostly cover all the Hill country in the North Western Himalayas besides the more etablished languages such as Kashmiri, Dogri and Punjabi. Bhadarwahi, Bhalesi and Curahi from an interesting Group and have much in common with each other. They are the intermediate forms of speech bridging the gap betwen the Punjabi or Dogri and the Kashmiri System. Curahi gives place on the east to Pangwali which in turn is closely related to Padari. On the South Crahi gives way to Cameali and Bhateali, the latter being a dialect of Dogri. Dogri itself the main language of the Jammu region was considered a dialect of Punjabi though now it is recognised as a sperate language closely related to Punjabi. Cameali is replaced by Bharmauri or Gadi on the East, while to the south of Chamba we have the Kangri and Madeali dialects, to the East of them the Kulu Group and to the south and south-west of them the dialects of Simla States. Its in Cameali and the Kulu and Shimla dialects and also in Gujuri and Sasi dialect that an iteresting similarity is noticed to Rajasthani which points to some close connections in the Past. The most interesting of this Grouping is the “Other Northern Himalayan” Dialects which shows a gradual transition from Gujuri, which is very similar to Punjabi to Kishtwari at the end of the line which is very similar to Kashmiri. This starts right from the Murree Hills in the Punjab to the Kishtwar region which borders Kashmir. We will try and review some of the samples from these from Western Hazara to East Jammu states. Gurjuri is closely allied to the Marwari dialect of Rajasthani and also has a fair mix of Punjabi in it. In fact the Gujars living in Punjab speak Punjabi and the languages are intermixed. Here we take the example of Gujuri spoken around Murree Hills. Tinauli is a language from inaul in Western Hazara and resembles closely to Dhundi or Kairali dialect. Dhundi/ Kairali language greatly resembles Lahnda, the Punjabi dialect of Western Punjab. Its also referred to as Dhundi Pahari and is spoken around the Murree Hills. The Punch dialect is again connected with the Lahnda dialect of Punjabi and is spoken around the Poonch region. In fact many Punchis actually refer to their language as Punjabi in olden times. Punchi is where the influence of Kashmiri starts and it includes a few words of Kashmiri as well. Of course it has great influence of Dogri as well. Padari is an extremely interesting dialect, spoken in Padar region of Kistwar on the banks of the Chinab. It has a striking similarity to Pangwali, spoken in the Pangi Valley in Chamba. Siraji is the language spoken in country north of Chinab between Ramban and Bhart on the way to Kishtwar. It is central to Doda and is also called Doda Siraji at times. Due to its location, to the North it gives was to Kashmiri, on West to Rambani, on the North East to Kishtwari, and on the South and South West to Bhadarwahi and Chamba dialect. Its generally frameworked like Punjabi but has many points in agreement with Kashmiri. Rambani as the name suggests is the language spoken around Ramban and like the Poguli which it closely resembles it is connected with Kashmiri though further away than it than Poguli. Rambani has a very largely Punjabi pronunciation whereas Poguli pronounciation is more like Kashmiri. Poguli is a language spoken in a small area to the East of Ramsu. It resembles Kashmiri though it is unintelligible to speakers of the Kashmiri language. However it seems that all speakers of Poguli have some basic understanding of Kashmiri. Nearly all pecularities of Kashmiri are found in Poguli which however contains a number of points in common with dialects which look to Punjabi as a fountainhead. Kishtwari is spoken aound the Kishtwar area of the Kishtwar region. It is considered a sub-dialect of Kashmir which it resembles very much. Kashmiri is well understood in Kishtwar. As an example we will take the same sentence and see how it is said in these different Northern Himlayan dialects which will help us in getting a sense from the dialects as they move from Punjabiness to Kashmiriness. The sentence is : How far is Kashmir from here ? Gujuri : Is ja te Kashmir taru kitno dur ni ? Dhundi/ Kariali : Ittho Kashmir tokni kina dur a ? Punchi : Is jai hoi Kashmir kitne kot di ? Siraji : Ellah atha Kashmira ta kitto dur chu ? Rambani : Itt ata Kashmira ta kito dur chu ? Poguli : Ita pata Kashir ta kituk chu dur ? Kishtwar : Yeti hata Kashiri tai kyuta thu ? This gives us a broad view and some understanding how people have interacted over the centuries from across the Valleys and the Mountains. The more similar the dialects the more would be the interactions amongst the people. This is a fascinating subject on how a language or a dialect gives way to the other and the interlude that takes place. 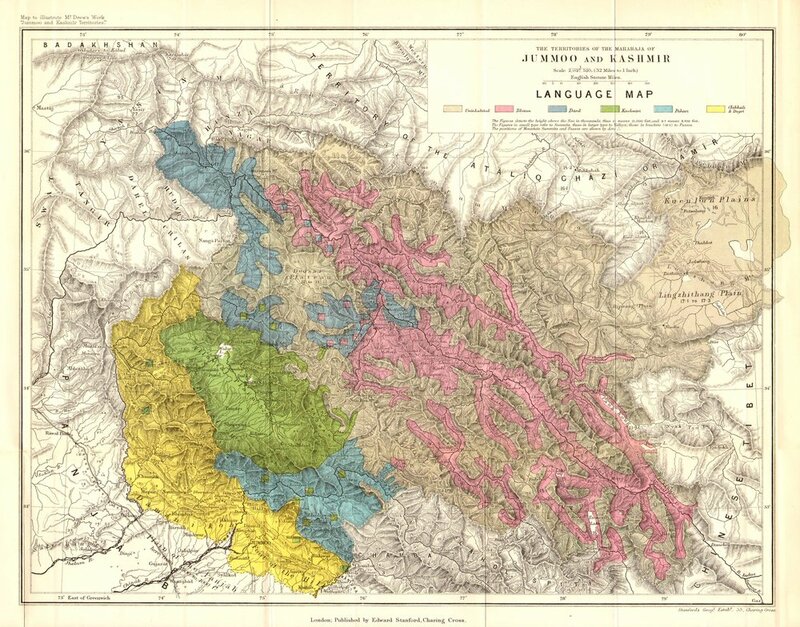 Main Source : Language of Northern Himalayas by Bailey 1908. All the meaty knowledge gained from there and some passages are verbatim from this source. For a more detailed study get a copy. Added references from various Source on the Internet. The Takri script (sometimes called Tankri) is an abugida writing system of the Brahmic family of scripts. It is closely related to, and derived from, the Sharada script employed by Kashmiri. It is also related to the Gurmukhī script used to write Punjabi. Until the late 1940s, And adopted version script of Takri (called Dogri, Dogra or Dogra Akhtar)was the official script for writing the Dogri in the state of Jammu and Kashmir and Kangri, Cahmbeali, Mandeali in Himachal Pradesh. There are some record of using Takri script in the history of Nepali (Khas Kura). Takri has historically been used by a number of Western Pahari, Garhwali and Dardic languages in the Western Himalayas, such as Gaddi or Gaddki (the language of the Gaddi ethnic group), Kashtwari (the dialect centered on the Kashtwar or Kishtwar region of Jammu and Kashmir) and Chamiyali (the language of the Chamba region of Himachal Pradesh). Takri used to be most prevalent script for business records and communication in various parts of Himachal Pradesh including Chintpurni, Una, Kangra, Bilaspur and Hamirpur regions. The aged businessmen can still be found using Takri in these areas, but newer generation has now shifted to Devanagari and even English (Roman). This shift can be traced to have happened during the period ranging from 1950s to 1980s. Pic below: A Dogra Period Currency Note from the Jammu and Kashmir Kingdom with inscriptions in Takri (The Central One), Devanagari and Urdu.